"Real science opens windows for us to look through. We're right at the footsteps of the most interesting scientists around." Tiny robotic sensors that police could set loose in a crime scene, looking for tiny clues. I really like the name for these items; it has a sort of Disney quality that contrasts nicely with their intended use. They do not seem to be nanotechnology, but they are very small robots indeed. A radio assayer hung from the track mounted in the apartment ceiling, having replaced the sniffer. Dustmice pushed through the cold stiff tendrils of once live carpet searching it for skin flakes and other debris trapped in the carpet's custom digestion. From Queen of Angels, by Greg Bear. I'm sure that these little robots would be very thorough; I also think that if they went across the floor in my house (after two kids), the little dustmice would run screaming out the door. And if they screamed, would their little tiny voices sound like Bob Newhart and Zsa Zsa Gabor, like in The Rescuers? Just wondering. 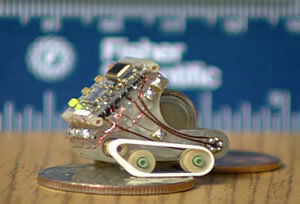 Read the news release at Smallest Mini-Robot. The robots are fabricated using stereolithography; read more about that on the entry for naonfax, from All Tomorrow's Parties, by William Gibson. Take a look at the grandparents of these little guys - the robot mice from Ray Bradbury's 1950 short story There Will Come Soft Rains.